In this lesson, we will learn how to solve word problems through forming and evaluating polynomial expressions using the information provided in the questions. 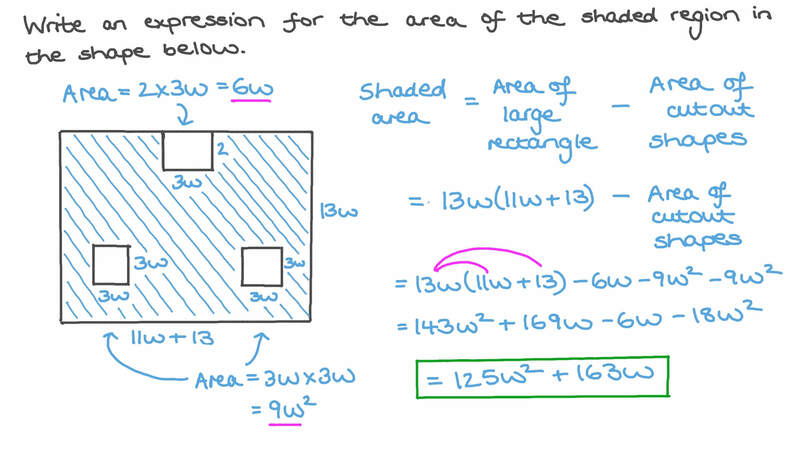 Find an expression for the area of the shaded region in the figure below. Express the perimeter of the figure below in terms of 𝑥 . Write, in the simplest form, an expression that represents the perimeter of the given triangle. The figure below shows a rectangle whose length is 7 cm and width is 𝑎 cm. If its perimeter is 𝑝 cm, write a formula for 𝑝 in terms of 𝑎 and find the perimeter when 𝑎 is 4 cm. Write an expression for the total area of the rectangle. 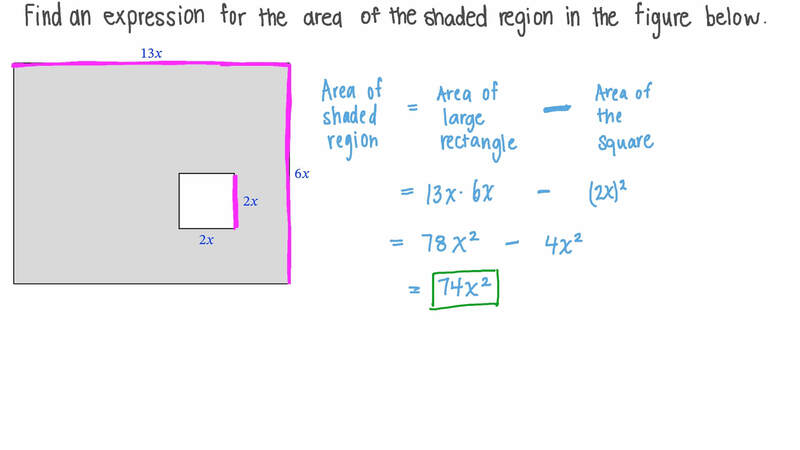 Write an expression for the area of the shaded region in the shape below. Find an expression for the area of the shape shown below. What is the total shaded area in the figure below? Amira received $75 on her birthday to buy a gift. She bought three new pairs of pants for 𝑠 dollars each. Write an expression to represent the amount of money she has left. Given that each pair costs $21, how much money does she have left? An online art shop sells paint brushes for $12 each and oil colours for $10 each and charges $7.5 per order for shipping. Denoting the number paint brushes by 𝑝 and that of oil colours by 𝑐 , write an expression that represents the total cost, and then calculate the cost of one order of 7 brushes and 9 oil colours. Knowing that a year consists of 52 weeks, make a table to find the algebraic expression that relates the number of weeks to the number of years 𝑛 . If the Greens have been living in a neighborhood for 19 years, determine that duration in weeks. A farmer harvested 36 pounds of cotton this year. Given that there are 16 ounces in 1 pound, determine, by making a table, the algebraic expression that relates the number of ounces to that of pounds, and find how many ounces of cotton the farmer harvested. Write an expression for the product of the cube of 𝑥 and the difference between 𝑦 and 7, all decreased by 2. Express the following as an algebraic expression: the difference between a number 𝑝 and 0.6, decreased by the same number 𝑝 raised to the fifth power. Write an expression for the cube of a number 𝑦 . Write an expression for the area in cm2 of a triangle of height 1 0 𝑥 cm and base 1 0 𝑥 3 cm. A square has sides of length 𝑙 . A new square is formed with double the side length. Find the perimeter 𝑃 and area 𝐴 of this new square. 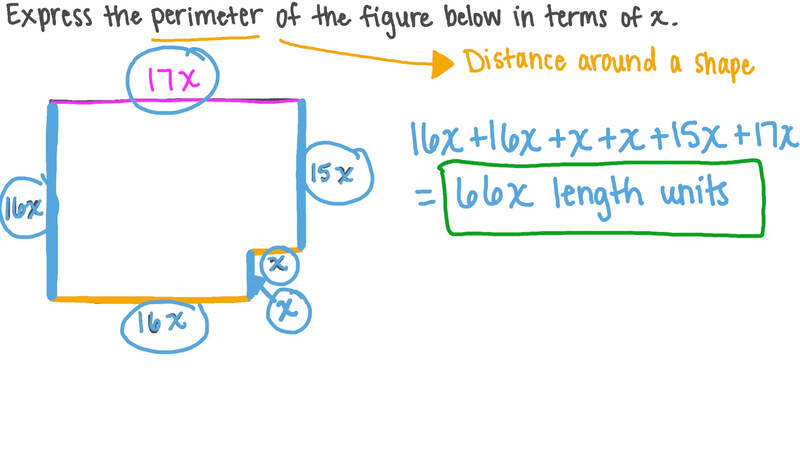 Find an expression for the perimeter of the shape shown below. What is the perimeter of a square whose side length is 4 0 𝑥 cm? The figure below shows a rectangle whose length is 3 cm and width is 𝑎 cm. If its perimeter is 𝑝 cm, write a formula for 𝑝 in terms of 𝑎 and find the perimeter when 𝑎 is 2 cm. Amira received $90 on her birthday to buy a gift. She bought three new pairs of pants for 𝑠 dollars each. Write an expression to represent the amount of money she has left. Given that each pair costs $16, how much money does she have left?